When you forget your glasses before a very important sandwich making competition, nothing is easy or obvious. 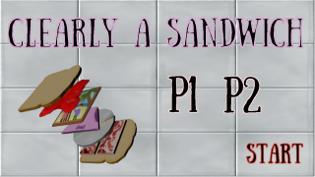 The clock is ticking, and you have to finish your sandwich before your opponent, while at the same time making sure that what you put in your sandwich is somewhat edible. Get ready for an adrenaline pumping, squinting game! You need two controllers (xbox 360).